To say the least, I am not at all displeased with your proposal to publish the poetry, or doggerel, or whatever else it may be called, which I sent you. I consent that it may be done, together with the third canto, which I now send you. Whether the prefatory remarks in my letter shall be published with the verses, I leave entirely to your discretion; but let names be suppressed by all means. I have not sufficient hope of the verses attracting any favorable notice to tempt me to risk being ridiculed for having written them. Accordingly Johnston published anonymously, in the May 5, 1847, edition of the Quincy Whig, the first two cantos of Lincoln's most serious poetic effort, "My Childhood Home I See Again", giving them as a main title "The Return'' and as subtitles "Part I - Reflection'' and "Part II - The Maniac.'' 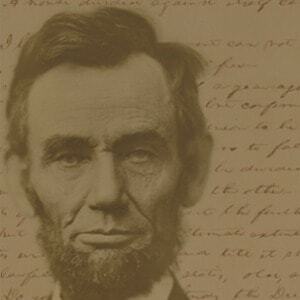 Quotations from Lincoln's letter provided the "prefatory remarks.'' The third canto mentioned here by Lincoln does not, however, appear in the Whig. If, as may be supposed, the third canto consisted of "The Bear Hunt,'' Johnston may well have concluded that it was unsuitable for printing as a companion piece to the other cantos. Autograph Letter Signed (“A. Lincoln”), 1 page, quarto, Springfield, February 25, 1847. To Andrew Johnston. Yours of the 2nd of Dec. was duly delivered to me by Mr. Williams. To say the least, I am not at all displeased with your proposal to publish the poetry, or doggerel, or whatever else it may be called, which I sent you. I consent that it may be done, together with the third canto, which I now send you. Whether the prefatory remarks in my letters shall be published with the verses, I leave entirely to your discretion; but let names be suppressed by all means. I have not sufficient hope of the verses attracting any favourable notice, to tempt me to risk being ridiculed for having written them. Why not drop into the paper, at the same time, the "half dozen stanzas of your own?" or if, for any reason, it suit your feelings better, send them to me, and I will take pleasure in putting them in the paper here. Family well, and nothing new.